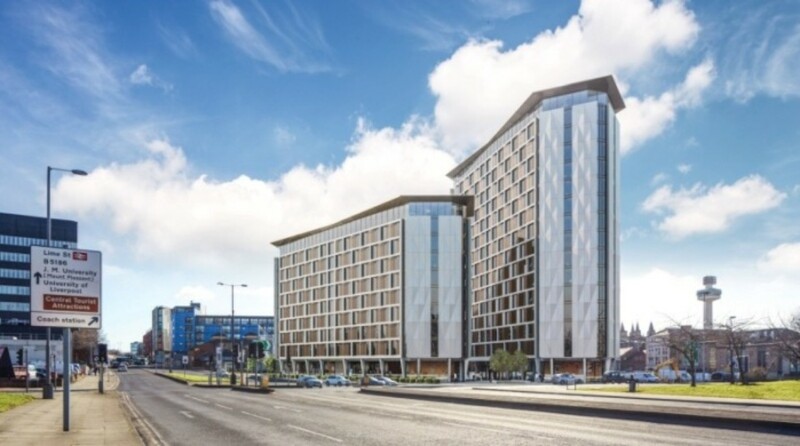 Natex, a new-build student property investment located strategically in the Liverpool city centre, is a commercial property investment with 9% returns p.a. with 5 years assurance. Unlike residential property investors, commercial property investors benefit from certain tax exemptions (T&C apply), allowing for higher returns on investment. According to prominent research outfit Savills, investments in UK commercial property has risen 66% to £4.2 billion in February 2018 compared with the same month last year. Savills states in its February Market in Minutes report that despite economic pressures from Brexit, investor appetite for UK property remains strong. In 2017, total investment into UK real estate reached £65.4 billion, representing a 26% increase on 2016’s annual total. In its latest report, the Investment Property Forum (IPF) said the outlook for 2018 has improved over the three months since its last survey was conducted, with average rental and capital value growth rates increasing in virtually all sectors. Its UK Consensus Forecasts report, which surveyed 23 property consultants and fund and investment management houses, showed that the rental value growth average forecast had risen to 0.8% from 0.4% three months ago. Student property, as a subset of the commercial property sector, remains a popular investment, boasting a low requirement of capital but yielding high returns. According to CBRE’s student accommodation index, between 2012 and 2016, annualised returns for the sector totalled an impressive 11.8%. This can be compared to the residential sector at a still respectable, but lower 7.8%, and commercial property as a whole, at 7.4%. READ Where is the Best Place to Invest in UK Student Property? Places at UK’s higher education institutions remain in demand worldwide. EU and non-EU students are the fastest-growing segment, bringing a net benefit of £2.3 billion per annum to London’s economy supporting 60,000 jobs in the capital. To date, there is a total of 1.7 million full time students in the UK. Of this number, 23% are foreign, bringing the growth of international students in the UK to a whopping 70% from 2006 to 2016. 23% of the 1.7 million fulltime students in UK are foreign. Above, HESA charts the largest international student nationalities in the UK over the past decade (Cushman & Wakefield). 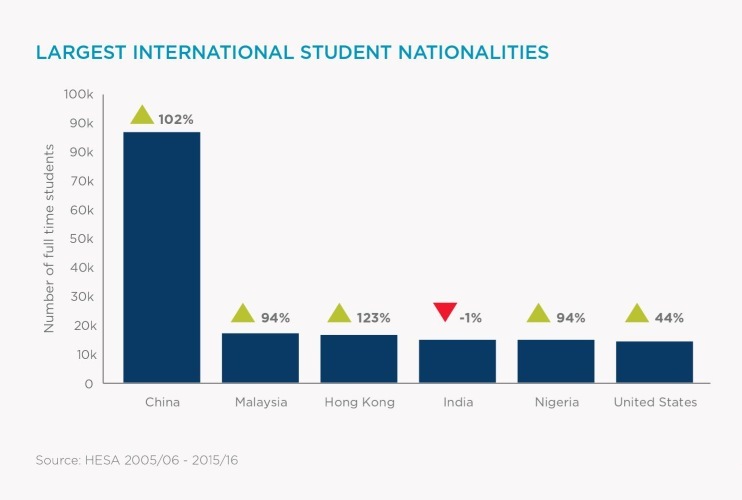 The Government’s recent removal of the student cap will provide more spaces for the large number of foreign students applying to study in the UK, increasing demand for quality student accommodation. New-build student developments like Natex in Liverpool and Bristol City House in Bristol continue to provide opportunities for the savvy investor thanks to their strategic location in the city centre and proximity to top universities. Care homes are another fast-growing segment of the commercial property sector. The UK is facing an aging population, with the threat of dementia becoming increasingly prevalent among the elderly. Patients suffering from dementia require specialized care, and living at a care home can ensure they have the best possible quality of life. Julian Evans, Knight Frank’s Head of Healthcare said that the UK care homes market faces an imminent crisis due to a national shortage of beds. However, this crisis and acute undersupply of care homes has created opportunities for investors, and will continue to drive investor appetite in the coming years. Research by ONS revealed that 1 in 4 people will be aged 65 years old in less than 30 years. Alzheimer’s Research states that 850,000 people live with dementia in the UK today. This figure is expected to balloon to two million by 2050. However, the supply of beds at care homes in the UK are not enough to meet this burgeoning demand. Care home investments can offer up to 8% net-yield per annum for up to 25 years, as well as provide an exit clause or contractual buyback. Got questions? If you’re interested in investing in UK commercial property, send us a comment or message below and we will get in touch with you!